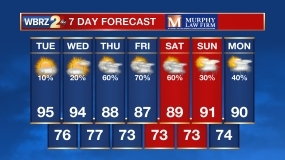 The forecast played out as expected on Tuesday with a record high temperature of 96 degrees achieved during the afternoon hours. The previous record was 94 degrees set in 1963. Rain coverage was very slim with only a few locations in Pointe Coupee and West Feliciana Parishes receiving a brief shower. 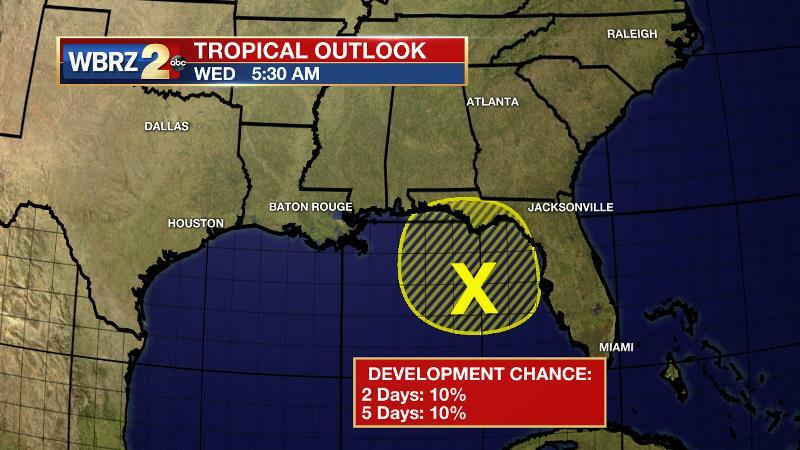 The Tropics: An unorganized disturbance in the northeastern Gulf of Mexico will not acquire tropical characteristics. However, the system will continue to produce clouds, showers and thunderstorms especially on its eastern side as it meanders off the Florida Coast. On the drier western side, this system may slightly enhance daytime convection for Louisiana and Mississippi through Friday before it weakens and drifts away to the northeast by the weekend. Today and Tonight: Wednesday will bring a somewhat better chance of a shower or thunderstorm. The most likely locations to see rain are southwest Mississippi and the Louisiana Coast. Action would flare up at the typical afternoon time once the daytime high near 94 degrees is met. Plenty of humidity will remain despite light, north winds. Overnight will be partly cloudy and muggy with a low near 71 degrees. A spotty shower will remain possible. Up Next: While the local area remains on the quieter, western flank of a weak low pressure system in the Gulf, a slight uptick in shower and thunderstorm action may continue through Thursday. The pattern will revert to slightly drier with continued heat and humidity Friday through the weekend. Saturday should have the lowest coverage of pop-up showers and thunderstorms. Do not look for much variation in temperatures, as highs will be in the low 90s with lows in the low 70s. Wednesday morning, water vapor imagery and 500mb analysis shows two areas of positive vorticity advection associated with a shortwave trough—one in Oklahoma and another in central Texas. Such perturbations are key in forcing convective development during the afternoon hours and their movement suggests the best chance of that occurring will be just north and just south of the Baton Rouge Metropolitan area. The upper level low pressure center associated with a weak tropical surface low in the Gulf will open up as it merges with the broader shortwave approaching the coast from the northwest. Energy and cooler temperatures aloft associated with this shortwave will tap into daytime warmth and humidity to slightly increase rain chances on Wednesday and Thursday. Still, precipitation is expected to remain in the isolated category with only about 20-40 percent coverage in the 13 Parish, 3 County forecast area. As the forecast area goes under the western side of the system, negative vorticity advection should take over. Rain chances will wane once again by Friday and the surface low will dissipate as it ejects to the northeast. After some weak ridging and therefore very low rain chances on Saturday, the upper level winds will become zonal allowing diurnal heating and microscale boundaries such as the marine breeze to be the primary drivers of any precipitation.